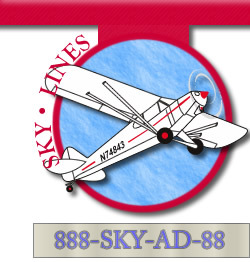 Welcome to Sky Lines Aerial Ads. We are an aerial advertising company strategicly located along the New England seacoast based out of Hampton Airfield in North Hampton, NH. We fly 5' red letter banners as well as Flying Billboards as large as 30' tall by 100' long. We service all of New England including Old Orchard Beach to Kittery, Portsmouth, Rye, North Hampton, Hampton, Seabrook, Salisbury, and all venues including Boston, Cape Cod and the Islands. 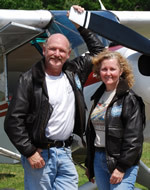 We fly Laconia for Bike Week, New Hampshire Motor Speedway at Loudon for Nascar, New England Dragway in Epping, and all outdoor venues in between. From one time personal messages to National Multi-Market exposures, we are committed to helping you or your company create lasting impressions at an affordable price. Are they at the beach, attending concerts, sporting events or county fairs? Maybe they’re stuck in rush hour commuter traffic. Where ever they may be, Sky Lines Aerial Ads can make your company stand out above the crowd. When the Maine State Lottery was launched, aerial advertising was given only 8% of their advertising budget yet 70% of the people questioned recalled seeing the aerial billboard. Now that's value for your advertising dollar! You too can experience that kind of exposure. With the sky as your backdrop, you can eliminate the clutter associated with other advertising mediums at a fraction of the cost. Assembly of your message with 5ft nylon letters (up to 40 characters) @ $2/ letter. Production of a custom flying billboard computer generated from your logo or custom design up to 30ft tall x 100ft long @ $2.25/ sq ft. Flight rates vary depending on demographics. Multi-flight discounts available. We welcome the opportunity to design an aerial advertising package to meet your specific needs. contact Gene Gray or Paula Maynard at 617-967-1905 or 888-SKY-AD-88 for a personally prepared quote.